We’re really proud of our history here at Giles Carpets. We’ve been supplying Kiwis with quality product and service for over 37-years now and today we have 2 generations of Giles family members holding the fort and delivering you quality product and service. 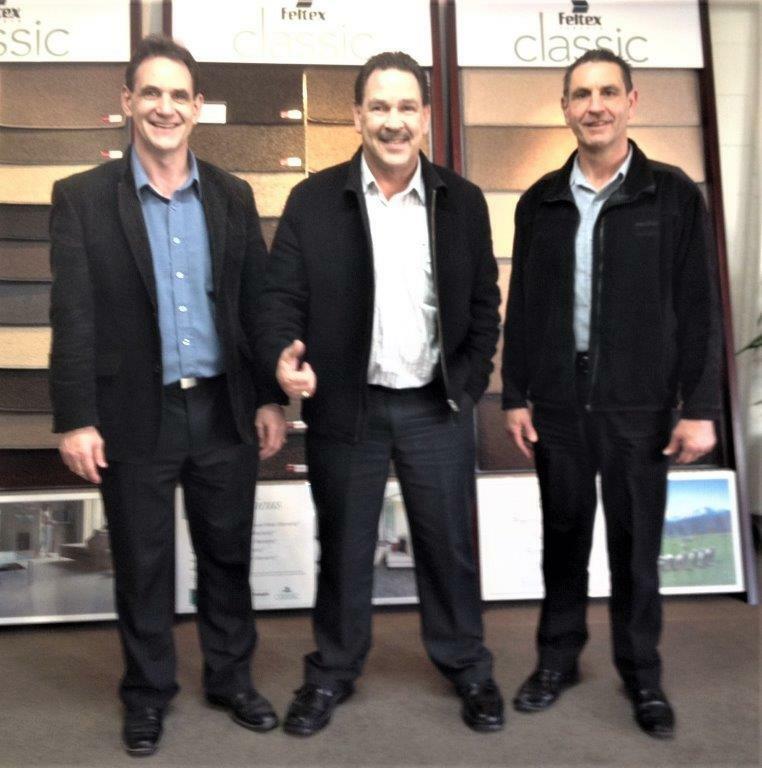 Kevin Giles began our first small Giles Carpets shop in Mount Roskill in 1981. 20 years of constant growth and expansion saw the company occupy a block of shops and warehousing space to accommodate our clients’ needs. Phillip (Kevin’s brother) joined the sales team 15 years ago and then their other brother Allen jumped on board in 2008 as Sales Manager. We’re thrilled this year to have one of Kevin’s twin daughters Angela join us and with her super powers behind the website and sales and marketing, the face of Giles Carpets is ever expanding! We're a really proud, hard-working, honest Kiwi family business with decades of happy customers - and we'd love to be able to help you too. The Giles brothers’ dad, Tom, was a much loved supporter of the Giles family business and was a true inspiration to his sons and grandchildren. He’s remembered and talked about daily in the showroom here at Giles Carpets and the family are reminded of him by his tribute you can see in the showroom... his very own favourite chair and hat. Tom was a renowned Kiwi poet who published many superb works in his book “Down in Kiwi Land”. You can read his poetry in our showroom and if you’re lucky enough you may be given a copy of his beautiful book! Tom and Ange on holiday in the Bay of Islands. It all began in 1981 with one little shop in White Swan Road, where Roop Darshan is now. 18 months later Kevin Giles moved his fledgling carpet business across the road to where the liquor store is, and over the next 19 years progressively took over the three neighbouring shops and the warehouse below. ​​Finally outgrowing their White Swan Road premises, the business moved to Stoddard Road, spending ten years in what Kevin calls “a useless building with no back access.” They had to rent a separate building for office space. In 2001 Kevin and brothers Philip and Allen ventured into property ownership, pooling their resources to purchase 52 Carr Road. The building proved the ideal home for Giles Carpets. A bonus is the large room which Kevin now proudly calls his ‘man cave’. Several times a week the man cave is host to Kevin’s other passion, pool. The Giles Carpets boys (and girls!) furnish two competitive pool teams; the Avondale RSA Legends (formerly the All Golds) and the Avondale RSA Originals. Giles Carpets has long been a family affair, with Kevin’s brother Philip joining him in 2002, brother Allen in 2008, and now daughter Ange learning the business alongside her Dad - joining just before Philip left after 16 years with Giles Carpets to live in Perth. The Giles team is supported by a loyal crew with long-service being a common denominator. Carpet-layer “Super-Stu” is the longest-serving at 35 years, teamed with Randy for the past 18. Lynfield local Jerry Mihaere joined 32 years ago and his two sons Jeremiah and Brandon now work alongside him. Roger and Fussy came on board 20 years ago, and when Hills Flooring had to close its doors six years ago, their top carpet layers Lisi and Mass joined the Giles team. Relative newcomer Dianne has kept the office running smoothly for the past four years, and the sales team has recently been joined by Paul Freeman, replacing Philip who moved with his family to Perth in April. Paul comes with 30 years’ experience in the carpet business, largely in the Blockhouse Bay area. -Published by the Blockhouse Bay Beacon in August 2018 to celebrate Giles Carpets 37th Birthday.